The Presidents neighborhood, so-called because many of the streets in this neighborhood are named for expired cheif executives, is a homey and relaxed area of Novato, California. There are lots of quiet streets with mature landscaping and many homes in the hilly portions of the neighborhood boast pretty views. Homes range in price and condition. This area is very convenient as it is close to everything and yet remains sedated by virtue of the fact that many of its streets are courts or cul-de-sacs. Novato High School is located here (see above picture) and so is Rancho Elementary (Marin County’s highest scoring school). 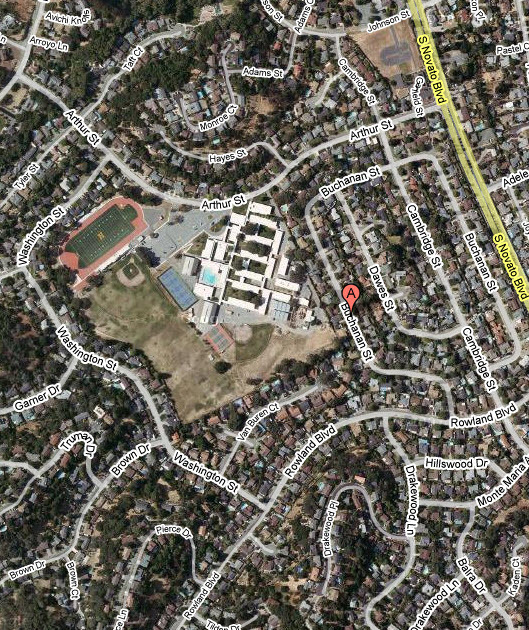 My name is Kyle Frazier and I am an expert on Novato’s Presidents neighborhood and have sold many homes here. I am a broker and certified residential specialist with Frank Howard Allen Realtors, the largest and most respected real estate firm in Marin County. Please call me at (415) 350-9440 if you would like to discuss Presidents, or Novato, in general. It is always my pleasure to be of service.